Of the many ways to heat a home in Columbus, forced air systems are the simplest in function and the easiest to maintain. They are so simple, in fact, it is easy to forget they need attention at all, but there are problems with not changing your furnace filter on time that have a real cost in efficiency and dollars. 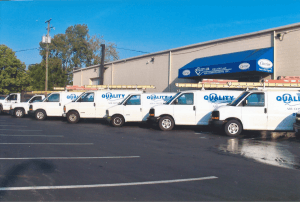 Contracting with a company like Quality Air Heating and Air Conditioning ensures consistent maintenance and oversight to allow home owners the comfort and relaxation you deserve in your own home. Usually in the basement or a central location, a furnace heats air to a temperature set by the thermostat. Over the years, technological improvements have enabled furnaces to be much smaller and fit into closets instead of the large furnaces of old that could fill an entire basement. By a fan in the furnace, the warm air is circulated through filters into a system of ducts to be distributed to grates in the wall or registers on the floor. A second grate and duct system returns cooler air back to the furnace to be reheated. When the system is properly maintained, it is clean, efficient and produces comforting heat on demand at the touch of the thermostat or consistently throughout the day and night. The furnace filter is designed to remove dust from air as it passes through your furnace. The longer your furnace filter is in place the dirtier it becomes. The increase of particles caught in the filter creates resistance to air flow through the filter and reduces efficiency. To make up for the loss of flow through a dirty filter, the heat exchanger, usually a gas or oil fired flame, must work harder to produce the same amount of heat to the space. This becomes costly financially and causes undo wear and stress on the equipment, requiring a partial or full replacement much sooner. Additionally, operating above ideal designed conditions, cracks in the chamber may appear from the over load which can allow carbon monoxide, a toxic gas, to be released into the duct work. To avoid problems and excessive strain, remember to change the filters at the beginning of each new heating season. An annual maintenance, check-up and thorough cleaning by a qualified company like Quality Air Heating and Air Conditioning ensures a safe and comfortable season of warmth with no need to worry about the dangers of not changing filters in your furnace.